SHARON TRASH TALK: DID YOU PICK YOUR CART SIZE YET? 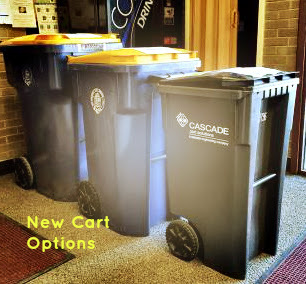 As the February 15 deadline for choosing the size of our trash cart approaches, I hear a lot of trash talk around town. Starting July 2018, Sharon will be implementing the new SMART (Save Money and Reduce Trash) Cart Program and with it, the days where every household pays the same price for collection service regardless of the amount of trash generated are gone. The silver lining is that with the SMART Cart program comes weekly recycle bin collection – a great improvement from the bi-weekly recycle service we currently have. I must admit that the most economical option, the 35-gallon cart, looked tiny in comparison to the cart we currently use. Determined to monitor our trash habits to figure out our exact needs, I started paying more attention to our trash bin. On average, our family of five produces about four kitchen trash bags per week – which is unfortunate because the 35-gallon cart fits only about three (13 gallon) kitchen bags. We cook 90% of our meals at home and we don’t compost. Although tempting, I don’t think we are likely to change those habits any time soon. But, the mind works in mysterious ways and while lugging the massive trash bin down my icy driveway one morning, a thought crossed my mind: could we possibly reduce our weekly waste to three bags or less per week and get the smallest cart? Determined to find out the answer before the dreaded “choose your cart” deadline, I gave it a go. Fair warning, if you don’t make your selection by February 15th, you are defaulted to a 35-gallon cart. Surprisingly, reducing the number of trash bags in our cart was much simpler that I initially thought. As it turns out, quite a bit of the trash we currently generate are recyclables that we throw in the trash. In part this is due to laziness – when our indoor recycle bin is full and we toss the yogurt container in the trash rather than emptying the recycle bin into the cart outside. This can go on for days…We also seem to stop recycling when our cart outside is full. Given the every-other-week recycle collection, this also happens often. Discussing this with friends, it looks like we are not the only family with the same minor but potentially costly mishaps. For our family, it looks like we could make do with a 35 gallon-cart if we make sure that all recyclable items land in the proper bin and not in the trash. With weekly recycle collection, this seems doable. It gives me peace of mind to know that we also have the option to purchase 33-gallon (huge!) overflow bags on as needed basis and pay as we go. The overflow bags cost $2.40 each. With the 35-gallon cart, we’ll receive 10 overflow bags free. These will come in handy for the occasional weekend BBQ or basement clean out (or just in case we get lazy with our recyclables on occasion). Not only is the 35-gallon cart is the most economical option, but it also qualifies our town for the MassDEP SMART grant program. MassDEP will award Sharon $30 per household that selects the 35-gallon cart. Therefore, the more households that choose the 35-gallon cart, the more money our town will receive. As an additional incentive, Sharon will become a MassDEP SMART town if over 50% of households choose the 35-gallon cart. This would make our town eligible for event more grant funds! Although the 35-gallon cart may not be the best option for larger families, we are choosing to give it a try. I’ll report back on how it goes for us later this year. There is always the option of swapping to a larger cart size (for a fee) next year. Did you take a closer look at your trash habits before choosing your cart size? If so, leave me a comment below.